When I setup a new PC, one of the very first things I do is installing a few necessary software that need to be installed to start working on the PC. This includes my favorite browsers, FTP tools, instant messengers, productivity apps, Office 2013 etc. Since I work on multiple PCs and frequently install Operating Systems on client PCs, it gets difficult when I have to install multiple software one by one. This seems to be a total waste of time. Up until now I have used utilities like Ninite and AllMyApps but the biggest problem with these utilities is that the user is restricted to installing only the utilities provided by these tools and they need to download everything for starting installation on each new PC. First of all let me go through some tools which I have used to install and update multiple software silently. These utilities can be useful for those who want to install the most popular programs in their PC only once. Ninite is the most popular tool for installing multiple programs using unattended installation mode. You just have to select the programs you want to install from the Ninite website and the installation will continue automatically afterwards. AllMyApps supports a lot more programs than Ninite. It includes freeware as well as commercial use software for installation. The only catch is that you need to create an account to install AllMyApps selected programs. Other similar software include Ketarin, Npackd, WPKG, SSDownloader (only security related apps), Soft2base, Appmatic, Just Install and Speed Install. These tools are not very useful when you want to install same set of software on multiple systems or you want to install an app that is not included in the repository of any of the above mentioned tools. The solution to this problem is Silent Install Helper. Silent Install Helper is a wonderful automatic software installation tool. It can make installing multiple software all at once on multiple computers. It does this without downloading each software setup again and again like Ninite. This feature is only available in Ninite Pro which is also able to install the selected software in a domain environment. 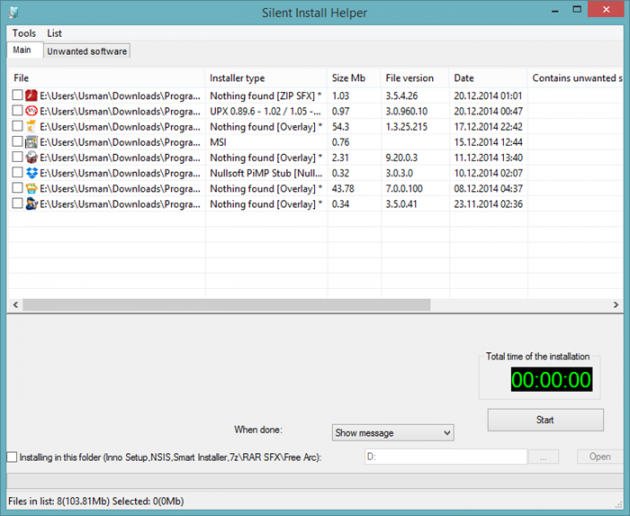 Silent Install Helper automatically installs all supported software silently. The supported setup installers include Inno Setup, Smart, Wise, Nullsoft NSIS, RAR SFX, ZIP SFX, Microsoft and Ghost Install Wizard. If an application has been packaged using one of the setup installers listed above, Silent Install Helper will automatically install the app silently with default options. You just have to drag and drop the application setups on the Silent Install Helper window. It will automatically detect the installer type and give you the list of software you want to install. If the installer type is Nothing Found, there is no way to install it silently. Only standard installer will be run which may need user interaction during batch installation. So it is advisable to remove the apps with Nothing Found types. To remove the apps from the list, just right-click the app and select remove. allmyapps is far better as compared to ninite because it supports firewall and commercial software as well.